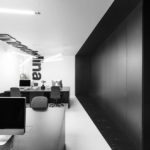 The new studio has a simple, minimalistic form with a monochrome palette, consistent with mode:lina™’s visual identity system. 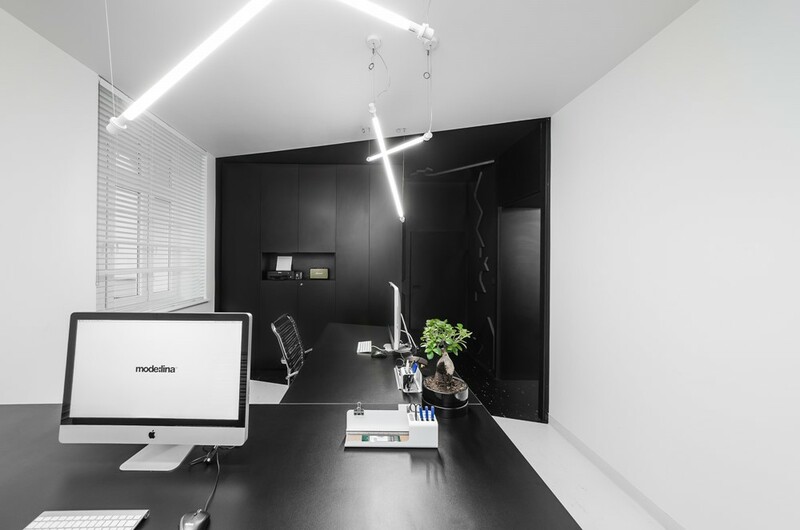 The design of the workspace is based on two contrasting black and white parts. The bright space is where the creative work takes place. It has large desks and work areas for designers. Custom-designed large shared desks allow for an easy transition from individual to team work. It was also very important to hide the cords, which were placed inside the desks. To link the arrangement of the new ofce with our visual identity system, the designers introduced large logotypes made of acoustic foam, which further increase the acoustic comfort of the space. The rooms which complete the functional programme of our studio are the ofce of Paweł and Jerzy – mode:lina™’s founders, and the adjacent conference room, where various awards and many copies of publications onmode:lina™’s work have been displayed. The remaining publications with articles on mode:lina™ welcome our guests in the entrance hall. Having more than tripled the size of the ofce, fnallymode:lina™’s ffth birthday present – a scooter has been put to use!